InkThemes is a WordPress theme marketplace and a WordPress theme membership site that provides professional themes at affordable prices. An InkThemes membership gives you access to all of their themes, which are easy to install and setup, fully responsive and translation ready, and can be used on unlimited domains. In this post, we explore the Geocraft WordPress business directory theme and provide a list of some of their other themes. Geocraft lets you set up a professional business directory website. You can add, edit, and sell free and premium directory listings, capture leads, add advertising banners, and more! Geolocation search functionality displays results customized to user’s location. Interactive Google Map displays listings as custom markers. Prioritize listings based on higher advertiser bids. Automated email notifications for listing approvals and expiries. Customized reviews and rating systems. Display categories and recently added listings in the sidebar. Import bulk listings using CSV format. Monetize web traffic with banner ads or Google AdSense. Learn how to publish books and create e-courses on a shoestring budget that will attract new clients and help grow your business. Are you looking for cost-effective ways to attract new clients, promote and grow your business, or create additional revenue streams? Drive more prospects and clients to your business. Market your business and create more visibility online. Gain a competitive business advantage. Increase awareness about your products and services. Build credibility, establish authority, and/or assert your expertise in your industry or niche market. In this strategic guide, we’ll show you how to publish books and create online courses on a shoestring budget that will help you increase revenue and grow your business. The currency of the ‘Digital Information Age’ is content. To participate in the digital economy, therefore, you must also learn how to become a content publisher. Additionally, we not only live in the digital age, we also live in the age of specialization. Specialization: The process of concentrating on and becoming expert in a particular subject or skill. Regardless of whatever business you are in, you probably have specialized knowledge about certain areas and a level of expertise about things that most people don’t know about. There is a positive and a negative side to having specialized knowledge. On the positive side, if your information is valuable and enough people want it or need it, you could develop it into a potentially profitable asset by sharing some or all of this information in the form of a book (or e-book) and/or an online course. The negative side of running a business that depends on having specialized knowledge is that your prospects and potential customers and clients often need to be educated on the value and benefits of your products and services and trained on how to do business with you, which is another reason why you should consider publishing a book (or e-book) and/or an online course. Publishing books and e-courses, therefore, is something worth considering as part of your business marketing strategy. It helps you achieve clarity about the value of your business and organizes your thinking about how to communicate your business processes. If you are strategic with your content creation and plan things well, you can be publishing regular blog posts or newsletters to market and promote your business while also building up the content and chapters of a book and/or online course (much like many best-selling authors nowadays write books with a movie in mind). At the end of a certain period of time (e.g. 12 months), you can then collate all of your blog posts or newsletters together to form a book. This tutorial is about ‘publishing’ content. Many people get put off by the idea of creating books to help market their business because they think that they need to be writers and authors. There is a great difference between authoring a book and publishing it. You don’t need to create the content yourself in order to publish it. J. K. Rowling authored the Harry Potter series, but Bloomsbury published it. Of course, if you have knowledge and expertise about a subject you can write the book yourself and there are many benefits in doing this, but you don’t have to be a writer to create a book. For this specific tutorial, we’ll assume that you already have an idea for how you will create your book or already have the content written and are ready to publish it. Promote the above online … all at minimal cost! Before publishing your book, ask yourself what’s the purpose of your book. Are you publishing to make money selling copies of the book itself, or are you planning to use the book to create wider exposure for your business … or both (i.e. make money selling the book and attract new customers for your products or services)? Your answer to the above will determine various strategic decisions and outcomes, such as how and where you should publish your book, to how much you should charge (or even give it away). If you’re publishing to make money and promote your business, we recommend starting the process by self-publishing an electronic book (e-book) before you consider moving to other publishing methods and formats (e.g. hard copies via print on demand or traditional printing, contacting publishing companies, etc). Cost – Self-publishing ebooks are the least expensive method of publishing. Testing – The method we recommend using below allows you to test the market and assess your results before deciding to invest further time and effort into the process. Improvement – With an e-book, you can edit, refine, and improve your content until you are happy with the results and ready (if necessary) to commit your book to print or invest in professional services (e.g. editors, distribution, publishers, etc). To explain the self-publishing process, we’ll use an e-book we’ve recently published as an example. Briefly, the book explains why most small businesses end up with an unmanageable digital presence and provides a system for helping small businesses develop a manageable digital presence that will help them get better results online. The book is written using MS Word. MS Word lets you easily save your book as a PDF file. Most ebooks, reports, guides, etc. nowadays are created and delivered in PDF format. More importantly, MS Word also lets you save your book in a format that will let you upload and publish to Amazon Kindle, which is the publishing platform we will begin with. This is explained in more detail further below. MS Powerpoint – For illustrations and diagrams. MS Visio – For flowcharts. SnagIt – We recommend using this powerful tool to create and edit screenshots. Photoshop – For editing and saving image files. Once your book is written, you can publish it on your own website or use a self-publishing platform like Amazon, Apple, Lulu, etc. 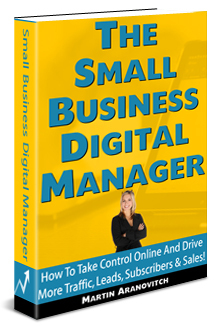 We’ve chosen to self-publish The Small Business Digital Manager on Amazon through the Kindle Direct Publishing (KDP) program to begin with. You can view the book listing on Amazon here. It puts your book in front of a huge global audience. Books published on Amazon KDP can be read by all devices. The KDP lending library pays additional royalties for books that become popular and widely read/shared. KDP has promotional features that help you create more exposure for your book. You have control of your book and can edit the content and pricing as many times as you like after publication. As mentioned before, you can create your book using Microsoft Word, including adding images and a table of contents. The only thing to avoid when using MS Word to create your book content is using bullets, as the format doesn’t convert bullets well. Instead, use something else, like dashes. One file contains all of your book’s images in a folder and the other contains the content of your book. You will need both of these files for your book to upload and publish correctly. The other thing you will need to do before publishing to KDP is to create a flat book cover image. This image needs to be quite large (for image specifications, go here). Amazon KDP offers loads of free tutorials on its site, from getting started, to formatting your content and promoting your book, etc. Make sure you go through some of these tutorials, especially the tutorials about formatting your book correctly and complying with KDP guidelines. Uploading your book to Amazon is a simple process. Now, simply go through each of the sections described below and fill in the details (refer to the KDP tutorials and user forum if you need help or if there is anything you don’t understand). Your book should take a day or so to be approved and published. Once your book has been published, it will be live on the Amazon Kindle Book store and available for purchase. You can return to your account and edit your book details, upload a revised copy, change the pricing, etc. any time inside your bookshelf. Amazon Kindle Direct Publishing offers an option to help promote your book called KDP Select. When you enroll in the KDP Select program, your eBook is locked for 90 days. During this time, you are given 5 promotional days where you can give your eBook away on Amazon for free. After your 5 free days are used up, your eBook goes back to being sold for the amount you have specified. You can renew this option. During each 90-day period, your eBook remains available in the Kindle Owners’ Library. While you are opted into the KDP Select program, you are not allowed to publish your book on other platforms, including publishing or giving the book away on your own website. If your website isn’t pulling in enough traffic, we recommend starting off with a platform like Amazon KDP before looking at the option of selling and promoting your books on your website. To learn more about self-publishing POD books with CreateSpace visit their website. Before we move on to discussing ways to promote your book, let’s take a look at the process of turning your book into an online course. Most of your course content is already written. An online course can be a natural extension of the work you’ve already done and the time you’ve already spent writing content for your book or business. In many cases, all you need to do is organize the information you already have into a format that will benefit others. Educate, train, and empower prospective customers. An online course can help train people to engage better with your business and empower them to become educated customers of your services. For example, if you run a craft supplies business, you could create an online course that shows people how to make unique craft objects or even how to start a business selling crafts made with items you supply. Expand your reach, leverage your expertise and increase revenue. Depending on your business, you may only be able to serve clients on a local level. An online course allows you to expand your reach on a global level and create additional revenue opportunities for your business. Leverage your marketing efforts. Just as publishing a book can help to establish authority, credibility, and expertise in your field, an online course can take things to a whole new level and give you new opportunities to market and promote your business and your brand. If you decide to turn your book or ebook into an online course or training program, the next step is to decide on the platform you will use to publish your eCourse. Your choice of ecourse platform will depend on factors like how much online exposure you can provide for your course, what kind of content formats you plan to use to create, present, and deliver your information, how you plan to handle payments and course registration, etc. For example, you can publish your eCourse on a platform like Udemy, or decide to run the course entirely on your own website. Online learning platforms like Udemy let you publish your course for free and can expose your information to thousands of potential new customers. Publishing your course on your own website is a great way to build an asset on your own domain name. You can add your course to your existing website or set up a new domain name to promote and run your course. We also recommend promoting your course inside your book, as the book is a perfect tool for generating leads and driving potential new course members. If you plan to add links to your course inside your book, consider driving visitors to your website, not to an external URL. Sending people to sites where you have no control over what happens can result in links that point to dead destinations. You can still run your course on an online platform – just refer people to a page on your website promoting your course and the course URL. Alternatively, you may want to publish a link to your course using a link redirection tool. This way, you can choose where to send traffic to and if anything changes, you don’t need to edit and republish your book or search everywhere for places where you’ve added your links. Just change the destination URL in your link management tool and all instances where you’ve added a redirect link will automatically updated with the new URL. Let’s show you how to publish your course using a setup that lets you automate processes like online marketing, content marketing, payment and registration of new members, affiliate marketing, email marketing, etc. and that gives you complete control over all aspects of creating, delivering and promoting your course. The platform that lets you do all this and more is WordPress. 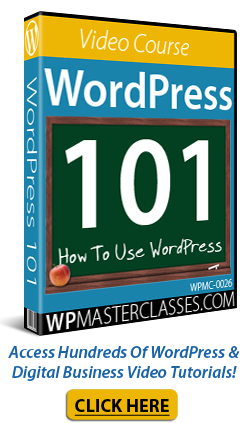 WordPress not only can be used to set up a website or blog for your business, it also lets you easily set up and run e-learning courses that integrate seamlessly with your website, plus add payment and registration facilities, a private member’s area, an affiliate management system, and a whole lot more. Best of all, WordPress is FREE, easy to use and lets you do almost anything you can imagine online with no technical skills required and at minimal cost. If you haven’t built your website yet, use WordPress. If you already have a website that wasn’t built using WordPress, then we recommend adding a WordPress blog to your site to drive more traffic and market and promote your existing site. You can do this all yourself using our WordPress step-step installation tutorials, or ask a professional web developer or web designer to help you. The important thing after installing WordPress, is to expertly configure your site. This will automate areas like search engine indexing and distribution and syndication of your content to social media and other traffic-getting sites and online directories. Other than your time, creating a professional online course with marketing automation using the plugins described below should only cost you a few hundred dollars to set up. WPCourseware lets you easily set up and configure training modules, course units, quizzes, include certificates of completion for course members, and more. If you want your course to be private so only paying customers can access it, then you will need to use a membership plugin. A membership plugin automates the process of registering customers, delivering content to registered users, adding customers to email lists, etc. There are many membership plugins available for WordPress. To accept payments online (e.g. PayPal), you will need a PayPal account and an e-Commerce plugin. You can just add a PayPal “buy now” button to your site, but then you will have to manually register all new course participants and give each of them private access to your content (i.e. set up individual logins and passwords for every new member). An e-commerce plugin can automate this process and send new members to your registration page after payment has been successfully processed. Certain WordPress themes have built-in payment processing features and there are also various merchant networks that will integrate affiliate marketing, payment processing, and member registration with your site. Online marketing is a huge topic. As we explain in “The Small Business Digital Manager,” many small businesses are too disorganized and unmanageable to market themselves online effectively. Without a strategic digital plan and the right systems in place, most tactics and methods never seem to be implemented or done effectively. With an expertly-configured WordPress site, most of your content marketing can be automated. Just publish new content on a regular basis and WordPress will do the rest. Publish educational content on your WordPress website and refer readers to your book or online course in your call to action. The more great content you publish, the more opportunities you have to attract new customers and sell your books and courses. If done correctly, every new post you publish is like another salesperson working for your business 24/7. Offer visitors a FREE sample chapter of your book or access to videos as an incentive for them to sign up to your newsletter and promote your book and online course in your newsletter or email updates. Use the data gathered from your site to improve your content marketing, test online ads, create promotional and educational videos, etc. You can obtain this data from your site by installing a plugin like Google Analytics for WordPress. Announcing the launch of your new book or course using a news release is a powerful and effective way to promote your course on media outlets and news websites. You should definitely announce the launches, but for a truly effective campaign, consider sending out monthly news releases. We recommend using the news release service at DistributionPress.com. They offer a complete done-for-you service that will get your news release distributed to hundreds of media sites and indexed in Google in less than 24 hours. An affiliate is someone who gets paid a percentage of any sales they help to create through their recommendations and promotional efforts. An affiliate program lets people register as an affiliate to promote your product or service and assigns them a unique affiliate URL to use in their email and website promotions. When people click on this special link, the affiliate program software identifies where the referral came from and if a sale is made, it then works out how much commission to pay the affiliate, makes the payment to the affiliate and deposits the balance of the sale into your bank account. You can run an affiliate program on your own website or use an affiliate network to promote and recruit affiliates for your program. If you decide to run an affiliate program on your own website, there are a number of WordPress affiliate plugins you can use. If you’re just starting out, however, we recommend using an established affiliate network like JVZoo or ClickBank to promote your online course. They process all payments and sales on your behalf and automatically pay your affiliates, saving you from having to manually administer affiliates and manage the affiliate payment process yourself. If you plan to add course members to an email marketing list, then you will need an email marketing service that integrates with WordPress. A number of WordPress membership and e-commerce plugins will automatically add new members to your email marketing list and have settings that make this easy to configure. Everything described so far will allow you to set up and automate a robust and cost-effective system for marketing and promoting your book and online course. If you plan to run live events like workshops and seminars, you can also use an event management and registration plugin to help you manage events, add event listings to your website, automatically process booking registrations, assign tickets, etc. Publishing a book and creating an online course allow you to profit from your expertise and are also powerful ways to attract new clients, increase revenue, and grow your business online. Best of all, this can all be done inexpensively, as shown above. We hope that you have found the above information on creating ebooks and online courses on a shoestring budget useful to help grow your business. Do you need to promote events on your WordPress website? Would you like to turn your WordPress website into an event management portal? In this post, you will learn how to create an event listing website using WP Event Manager, a flexible and versatile plugin that works with any WordPress theme to create an event website quickly and easily. If you host many events and use WordPress to power your website, you may want to consider creating an event listing website or turn your WordPress website into an event management portal using an event management plugin. When creating an event management website, some of the features you will want to add to your site include forms for registering and submitting information about events, ways to manage and display all relevant event information to users and sell tickets, a reliable event calendar WordPress plugin and more. In a separate tutorial, we provide detailed information about the Event Espresso event management and registration premium plugin. In this post, we look at a flexible and versatile FREE event management plugin called WP Event Manager, which allows you to create an event ‘marketplace’ and sell event listings on your WordPress site. WP Event Manager is a lightweight plugin for event registration which adds event listing functionality to your WordPress site. With this plugin installed, you can showcase and sell tickets for your own events or create an event marketplace and allow online users to submit and manage their own events and charge users for this service. The plugin is easy to set up and install and works with any WordPress theme. It is also free to install. The free version has all options you need to create a simple event listing site and run an event management system. Advanced functionality is available through paid add-ons. Add-ons allow you to expand your event listing site with features like selling tickets, creating alerts, allowing users to search events by location, and more. SEO Friendly & Compatible with SEO plugins. Add, manage, and categorize event listings using the familiar WordPress user interface (UI). Searchable & filterable ajax powered event listings can be added to your pages using shortcodes. Frontend forms allow guests and registered users to submit & manage event listings. Allow event listers to preview their listing before it goes live. The preview matches the appearance of a live event listing. Each listing can be assigned to an email or website address so that attendees can register for the events. Searches also display RSS links to allow attendees to be alerted to new events matching their search. Allow logged in organizers to view, edit, mark cancelled, or delete their active event listings. Developer friendly code, Custom Post Types, endpoints & template files. You can use the Setup wizard to set up the plugin or configure it manually using the ‘Settings’ screen. With WP Event Manager you can create a WordPress events listing siteusing frontend and backend submission forms of events for free. Event organizers can list their events on your website using the frontend submission form by filling out the event description and location, plus other details. You can also disable frontend submissions. Before event organizers make their event listing go live, they can see how their listing will look when published. The preview will be identical to the published event listing. Event organizers can edit and correct their listings until they are happy with it looks and are ready to publish it live. Let’s go through the settings section. Before creating events, we recommend configuring the plugin settings. Go to Event Listings > Settings and you will see a tabbed interface indicating accessible settings. Setting tabs are divided into ‘Event Listings’, ‘Event Submission’ and ‘Pages’ settings. Cancelled Events – If this option is enabled, cancelled events are hidden from archives. Expired Listings – If enabled, the content within expired listings will be hidden. Otherwise, expired listings will be displayed as normal (without the event registration area). Multi-select Categories – If enabled, the category select box will default to a multi select on the events shortcode. Multi-select Event Types – If enabled, the event type select box will default to a multi select on the events shortcode. Category Filter Type – If enabled, the event type select box will default to a multi select on the events shortcode. Event Type Filter – If enabled, the event type select box will default to a multi select on the events shortcode. Account Required – If you disable this option, users who are not registered (guest) will also be able to submit listings. Account Creation – Users without an account on your site will be able to create an account by entering their email address on the submission form. Account Username – If enabled username will be generated for the user based on email address. Account Role – Specify which role to assign users who register. Moderate New Listings – If enabled, you can moderate new event submissions. These will not be active until you approve them. Allow Pending Edits – If enabled, submissions awaiting admin approval can be edited by the user. Delete Expired Listings – Expired listings will automatically be removed after 30 days if this option is enabled. Listing Expire – Set event submission expiry time. Submit Event Form Page – Select the page where the form will be located. Event Dashboard Page – Select the page where the dashboard will be located. In the sidebar, you will see two options named ‘event categories’ and ‘event types’ (if you enabled those in the ‘Event Listings’ settings tab.) You can select single or multiple event types and event categories. An event management dashboard listing all events is available for managing and editing events. This dashboard makes managing and editing event listings simple and easy. From this event dashboard, you can control the status of all your events or edit, add new, or delete existing entries. Add-ons expand the functionality and usefulness of the core plugin and can be purchased as and when required. The price of add-ons range from $19 – $39 for personal license and $49 – $99 for a developer license. Licenses grant users one year of support and updates. Personal licenses are valid for a single site, while developer licenses are valid for multiple sites. Google Maps – To enable event search by location, use the WP Event Manager Google Maps add-on. This will integrate the feature of the search through maps and locations. It also enables proximity search on your website. Registrations – This add-on allows visitors to register for an event on your site as an attendee. When they register, you can view it through the dashboard and also manage the registered participants. Sell Tickets – This add-on enables you to sell events tickets for displayed events. Registered users on your website are also able to sell their tickets. Using ‘Sell Tickets’, you can sell simple and variable ticket types. Calendar – Using this add-on lets you display an event calendar that lists the upcoming events on your website. Event Alerts – Allow registered users to get event alerts. This add-on lets users create email alerts based on keywords, location, category, tags, etc. Users can also choose the frequency they want to receive email event alerts. Bookmarks – The bookmarks add-on allows visitors, attendees or anyone to bookmark events on your website. It’s like the wishlist feature in online stores. Visitors can come back to site and find the event without having to spend time searching for it again. Bookmarks can be saved with a note and only logged in users can bookmark. Embeddable Event Widget – Use this add-on to display event listings of your website on other sites. It will generate a code according to the requirement clauses you submitted (particular keyword, the specific location of events). You can paste this code wherever you want into any website (it doesn’t have to be a WordPress site) to display events. Sliders – Display events in a slider. Sliders are responsive, which means they will look great on mobile devices as well as on the desktop. Event Tags – Improve event search and target more keywords. This add-on adds tags for the event post type. Tags are keywords related to your event. You can add tags that describe your event, event type, subject, or anything relevant to your event. Users will be able to filter events by tags. Eventbrite Integration – When you start your event listing website, it will probably be empty. You can avoid this by filing event listings using the Eventbrite Integration add-on. All you need to get started is a publisher ID from Eventbrite. Eventbrite events include affiliate links and click tracking and are listed in a similar format to your local events. You can just pull the events by using the search parameters you define in the settings. Organizers – This add-on lets you organize your organizer’s list and the events according to their organizer. You can display grouped and alphabetized list of all the organizers. It can also show total active events of each organizer and complete list of organizers. Contact Organizer – Allow your visitors to contact the event organizer. Export – You can export all the events on your website in CSV format. If you want you can export the events with all the fields or export the events with required fields only. In this way you can export only what you need. Print – This add-on will enable a print button on event detail page. By clicking the button, you can save a digital copy of the event page, or you can just print it by connecting a printer. iCal – This add-on enables you to generate and download an iCal file of all the upcoming events on your website. Then you can import iCal file to Google calendar or any other calendar. Google Recaptcha – You can use Google Recaptcha on the submit an event page to prevent spam. If the visitor fails to solve the captcha puzzle, the access to submit will be denied. Visitors will have a chance to make another attempt to solve the captcha. Google Analytics – This add-on lets you track your site using the Google Analytics tracking code. Emails – Use this add-on to send an email notification when a new user registers. You can create your own email templates or edit and change the existing ones. These will override the default WordPress registration email notifications. Event Logs – This add-on allows you to view the debug information in your browser console tab to find and resolve any errors on your website. Single event listing page contains information like metadata, event overview, organizer description, organizer details, event venue, event date, time and location. This plugin can be used with any WordPress theme. Your events directory and information will be preserved if you decide to change the look and feel of your website later. WP Event Manager can also be translated into any language. If the language you want is not currently translated, partially translated, or needs correcting, contact the plugin developers to request information on how to edit or create a translation file. This file will then be automatically used when the site is viewed in that language. WP Event Manager plugin lets you display all relevant event information in one place and gives you a complete system for creating, organizing and managing events. Use the free version to make users aware of upcoming events, free-for-all events, community , social, or sporting club events, webinars, conferences, workshops, fundraisers, etc. and choose premium add-ons to add more features and provide users with more details about events, including adding the ability to sell tickets, create alerts, display maps, etc. We hope you enjoyed this tutorials. Download the WP Event Manager plugin for free from the WordPress plugin repository or check the official plugin site for more info and documentation.